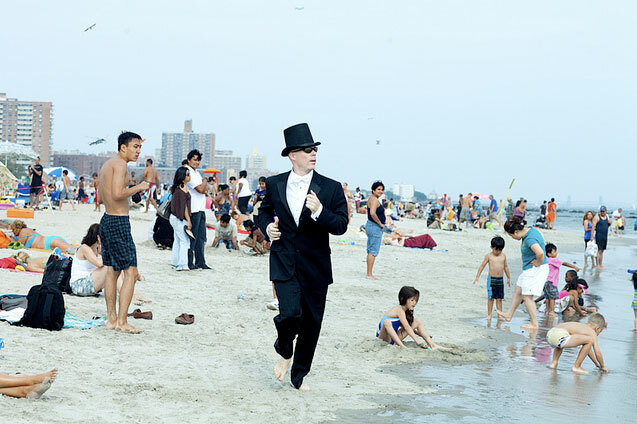 Improv Everywhere (our favourite group sport) brought their antics to Coney Island yesterday, turning a beach day into a black tie affair! Hundreds of folks dressed in tuxedos and gowns confused the regular beachgoers, as they played in the sand and swam in the ocean in their formal wear. According to IE, they "covered a mile-long stretch of beach with a diverse group of people of all ages (from babies to sixty-somethings) laying out, playing games, and swimming in the ocean, all in formal wear. The mostly Russian crowd of beachgoers appeared to have a blast watching the spectacle unfold, laughing, taking photos, and asking questions." Stay tuned for video!